The biggest problem with the PlayStation Vita is that many titles don't quite "get" it. Either they go in deep with all manner of touchscreen hybridization at the cost of player comfort, or they concentrate so hard on providing a full console experience they forget people don't always have over an hour to spare when playing on the road. Ragnarok Odyssey is such a success because it gets the PlayStation Vita. In fact, I'd go as far as to say that it's damn near perfect as an example of exactly how Vita games should be. This, right here, is a masterclass in handheld software design. 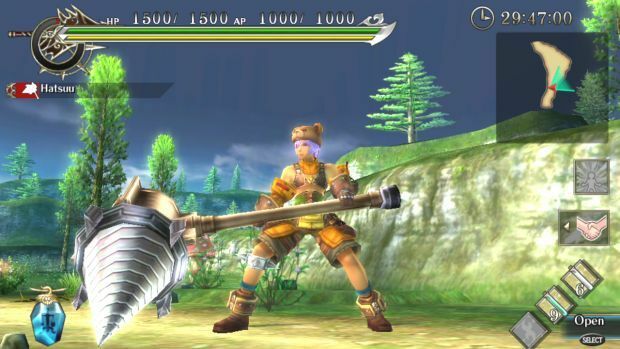 Ragnarok Odyssey is a spin-off of the popular Ragnarok Online MMO, a brand I must confess a lack of familiarity with. Prior experience doesn't really matter, however, as the game is light on lore, heavy on action, and is likely going to resonate more with players of Capcom's Monster Hunter installments. While there is a light story, told mostly through optional NPC dialog, Odyssey has its sights trained primarily on tossing players straight into the action. The adventure begins with a surprisingly deep character customization mode. While heroes are built using presets, there are a ton of options, including 18 faces, 19 hairstyles and even 16 voices per gender. Hair can be tweaked using a full spectrum of colors, while each outfit (initially bound by class but later entirely swappable) has four dye schemes to choose. Progression through the game's multiple missions and chapters are fairly linear and straightforward. You pick a mission from the guild hall mission counter, head out to perform the task (usually killing certain monsters or collecting a number of items), then return with the spoils to pick another. That's more or less it. Missions are timed up to thirty minutes, though most of them can be completed well within that restriction, and so progress feels more like a lengthy procession of snack-sized challenges rather than a full, unified experience. Players can choose one of six classes, each with its own set of skills and weaknesses. The Sword Warrior is a balanced class focused on both attack and defense, while the Assassin makes up for its physical weakness with speed. 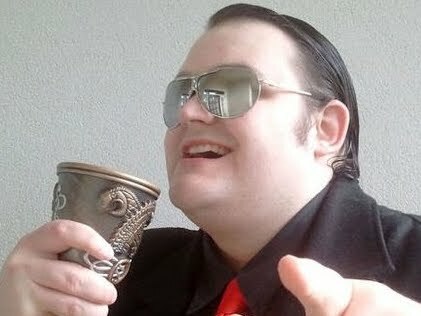 More specialized classes include the Cleric, a defensive tank that can self-heal, and the Hammersmith, a sluggish fighter that specializes in all-out attack. There is also the Mage for area-of-effect spells and the Hunter for long-range damage. You can change your class at any time between missions, which is a good thing, because it can take a lot of experimentation to find the job that finally "clicks" with your playstyle. Like Monster Hunter, players regularly head out into a territory made of multiple smaller maps and littered with monsters that drop valuable crafting material. Each class has a range of attacks and combo moves to pull off, though they control more or less the same. 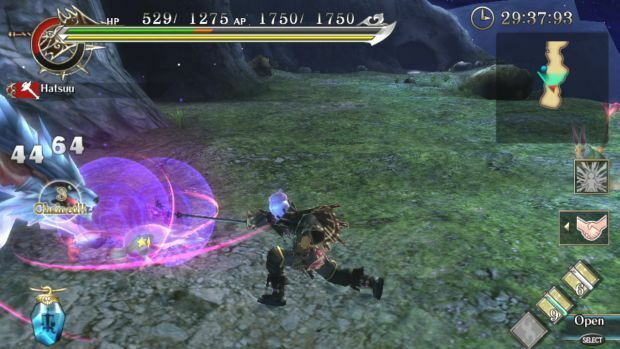 Regular melee attacks are performed by pressing the triangle button, while advanced skills are utilized by pressing circle at various stages of the melee sequence. Most classes can also guard with triangle and RB, as well as dash with the square button -- crucial for closing distances and avoiding enemy strikes. Combat is a satisfying barrel of brawler-style button mashing, and Odyssey isn't afraid to ramp up the challenge when it sees fit, assaulting the player with multiple aggressive foes or huge boss creatures that can take quite a pounding before falling. The difficulty spikes can be quite a shock to the system, especially as missions go from too easy to surprisingly ravaging at the drop of a hat. It's usually not too much of a problem, save for the fact that Odyssey often relies on the old cheap method of providing enemies unbreakable combos that are capable of stopping your own attacks far too easily. Most opposition can be skillfully overcome with smart use of dashing and guarding -- but be warned that often it feels impossible not to take damage, and some of the grouped opposition feels straight-up bullying as foes take turns to smack you down, render your character dizzy, or toss you halfway across a room. Annoyances aside, battles are pleasantly fast-paced, with a recurring theme of juggling beasts into the air and smacking them back down after some aerial combos. Attacks, dashing, and sprinting are all governed with an AP meter, which requires constant monitoring, but refills quickly, providing just the right balance between challenging users, and keeping them capable. 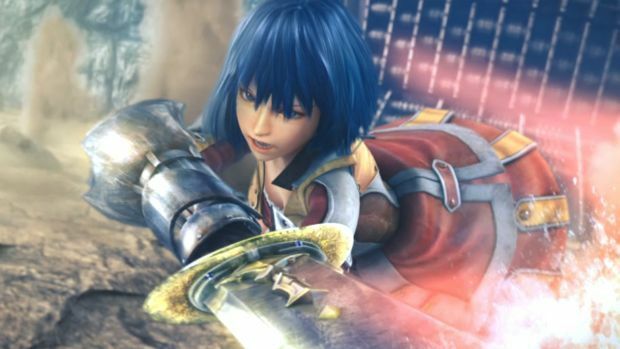 There's no leveling system, as per traditional role-playing games, and the only stat upgrades provided by gear are an attack bonus on weapons, as well as an inconsequential boost to all stats after clearing each chapter. Instead, characters improve by equipping cards collected at random from defeated monsters. Each player's outfit has space for up to eight cards, and clothing can be expanded to hold more expensive ones (each card has its own equip cost). These cards grant anything from attack and defense bonuses to elemental effects, extra healing properties, and bonuses to class-specific skills. Mixing and matching a winning combination of cards is a key component of the game, and it can take quite a bit of fiddling to find the build that works. In addition to cards, materials gathered in missions are used to refine weapons to enhance their damage output, expand outfits, and purchase aesthetic headgear for simple self-amusement. The headwear is a joy in itself, as players gradually unlock a range of accessories from simple helmets to paper bags, ghost sheets, and devil horns. Odyssey really doesn't take itself seriously -- there's plenty of scope to make a character that looks ridiculous. All told, the lack of leveling is a bold and interesting move, while the cards can often be far more compelling than simply gaining experience to hit the next upgrade. However, one detrimental effect is that it will often feel like there's a glass ceiling in place, preventing you from ever acquiring a rewarding advantage over the enemies. This has come to a head with my Cleric, which simply isn't dealing enough damage to take down a boss within the thirty-minute time limit. With nobody online currently available at my level to come and help, I feel like I'm stuck waiting until I can recruit, lest I retune my playstyle with an all-new class. Upgrading equipment can also feel like a lot of waiting is required, due in no small part to the fact that some crafting materials may only be farmed by beating certain bosses over and over. The game really isn't good at telling you where items can be found, leading to either a good deal of guesswork or no small amount of Googling. Even worse, some of these drops can even be random, meaning that replaying a boss won't guarantee you'll get what you came for. Eventually, as with cards, you'll feel like you've hit a ceiling, unable to improve until you clear another chapter, and even then, unsure if you actually do need to fight an undiscovered monster or beat one from any number of previous missions. 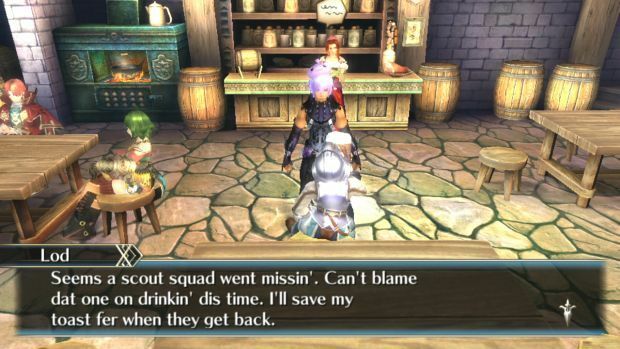 These complaints aside, Ragnarok Odyssey is still a ton of fun. Some may find the mission structure repetitive, but it's perfectly suited to the kind of portable experience that works best. It's designed to waste an hour of one's time on the player's whim, and in that regard it succeeds. What's more, with a ridiculous amount of content on offer (it easily rivals many console RPGs in terms of sheer volume), you'll be hard pressed to find a better standby title for those moments where you need a quick gaming fix without any fluff getting in the way. Players can cooperate locally or online via the tavern, which works exactly like the guild hall except missions are tougher. Up to four players can team up using a fairly robust and customizable matchmaking system. Each match room will have one player as leader, responsible for selecting missions, though missions are restricted by the unlock progress of the partner who's played the least (e.g., if someone on your team hasn't beaten the first chapter, you won't be able to play beyond that). Solo fighters looking for a bigger challenge can also enter the tavern unaided to play through missions on a tougher setting. The online experience is decent for the most part, though it can occasionally suffer from temporary freezing that locks the action up for a few seconds at a time. When it's not doing that, it's responsive and fast, but it can happen at a rather irritating rate. It's a shame, because playing cooperatively really demonstrates how well the classes work together. There is also a fantastically deep range of communication options, with a full in-game chat system and characters able to pull of a large amount of amusing emotes. The controls are where Ragnarok Odyssey really shines, and it's here where I justify my prior claim that this game "gets" the PlayStation Vita. Almost all of the controls are performed using the physical buttons. Movement, attacks, cameras -- it's all done using the hardware. The only use of the touchscreen comes with potions (drink to heal or provide temporary boosts) and player interactions, all pulled off using virtual icons placed at the edge of the right-hand side of the screen, doing little more than expanding the control options in an intuitive, convenient way. Other games such as Unit 13 have done this too, but Ragnarok Odyssey really limits its input options to ways that make the game more efficient, rather than more showy. It isn't interested in forcing players to swipe across the screen in ways that keep their hands off the real controls. It only cares about exploiting what the Vita can do to make the user's time better. By putting potions and chat options on the touchscreen, it eliminates fiddling with menus and provides easy access to in-game features that are usually a hassle to navigate even through traditional input. I cannot praise this decision enough. Visually, this might be the best-looking Vita title to date. Avoiding the washed-out color scheme that seems to have affected many early titles, the bold and colorful art style is helped along by a range of flashy visual effects and fantastic animations that make for a vibrant and appealing game world. Environments are a little basic and flat, but the cartoon-style atmosphere helps them get away with it. What's more, the loading times are absolutely phenomenal. I don't think I've played a full-size Vita game that has been able to load so fast -- remarkable when one considers just how good it looks. I'm not sure what was done to get those load times so trim, but it's highly appreciated. 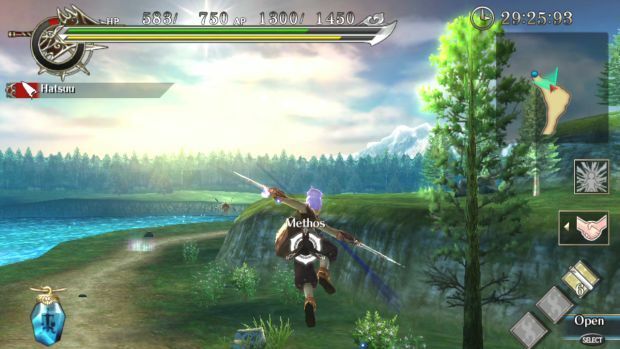 Ragnarok Odyssey is brave in its attempt to provide something different in a traditional package. It's cute, its combat is engaging, and its challenge isn't to be sniffed at. It can become frustrating at times, especially when trying to upgrade and improve one's character, and it can certainly grow repetitive. However, I have to say that this is absolutely the best PlayStation Vita game I have played, and I've played most of them. For all its missteps as an action-RPG, it is simply flawless as an example of how to make a Vita experience work. Judicious use of touchscreen controls, beautiful visuals, a smartly broken-up mission structure and eerily swift loading times make this the gold standard for Sony's portable. If handheld developers don't take any cues from this one, they're absolutely doing it wrong.